CANMORE, AB – Grizzly Paw Brewing has announced the release of the latest installment in the 622 Main Street Series, a selection of limited edition lagers brewed at – and named after the address of – the original Grizzly Paw brewpub in downtown Canmore. Light and sweet pilsener malt flavours dance in a delicate balance with spicy and floral Saaz hops, while a clean, refreshing bitterness leaves you ready for the next sip. 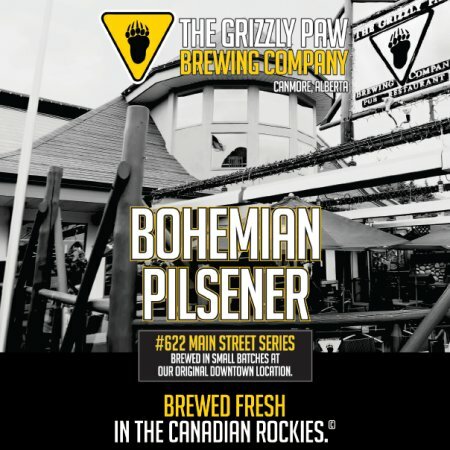 Bohemian Pilsner is available starting today (July 10th) in 650 ml bottles at the Grizzly Paw retail shop. In addition, Grizzly Paw has announced the addition of two new 70HL tanks at its production brewery, increasing fermentation capacity to 480HL in order to meet growing demand for its products.